New Camtasia 2018 template available. Depth-of-Field, or DOF, Logo Intro Template Collection. The collection includes three different logo intros with depth-of-field effects, three depth-of-field text templates and a lower-third dof bonus. Sound effects are also included. Check out the preview video below for more. This template collection was made for Camtasia version 2018. Depth-of-Field or DOF, is an effect you normally see in photographs taken by shallow depth-of-field lenses, where part of the image is out of focus while other parts are sharp. We have here re-created this effect inside Camtasia, so you can use your logotype and create for example logo intros. Sound effects, texts etc. are also included. TechSmith Camtasia© is made by TechSmith Corporation. More info: TechSmith Camtasia. This Camtasia Template Collection is an independent Library Asset for Camtasia, made by SoftwareCasa/Callouts. SoftwareCasa is not associated with TechSmith Corp. 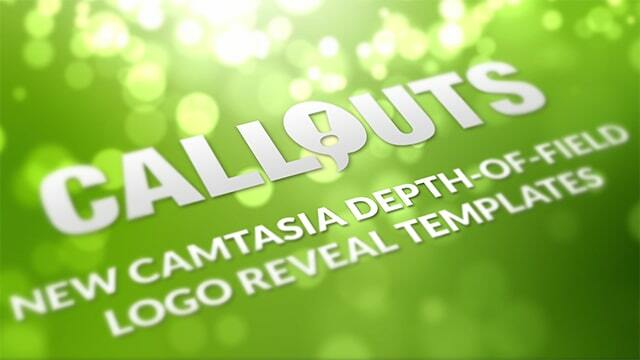 This Camtasia Template Collection for Camtasia can be downloaded by members on www.callouts.com.